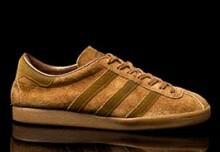 adidas continued with the re-issue’s for the Spring/Summer 2012 collection with the release of the Tobacco in three colourways. To make a refreshing change, adidas went back to basics with the original concept of the shoe by going for a high quality suede in a somewhat restrained colour palette. The drop included white, blue & black, but let’s focus on the white. 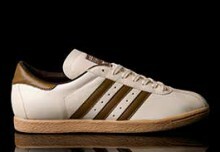 Not an actual true white, more of a stone colour, with matching stripes to keep the lines simple. A welcome return to the gum rubber sole too adds to the appeal, as it seems the trend was sliding towards white soles of recent releases. Matching stripes, laces, stitching and heel tab all bring the shoe back around to what adidas used to do best; fantastic looking trainers without the gimmicks. Compared to the SneakersNStuff & Size? 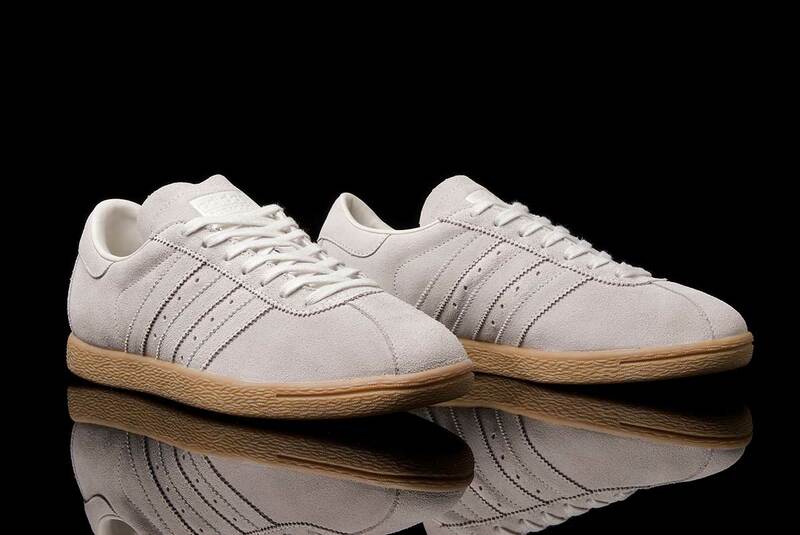 recent release of the Tobacco, which I refer to as the Chewbaccos due to the shagpile effect of the suede used on them, there is a difference in the two. Firstly, the toebox is sleeker on this version, only by a couple of millimetres, but it’s noticeable when wearing. Also the tongue is shorter, which makes for a neater finish. One thing that is possible with this edition is its blank canvas ability to be dyed various colourways to individual tastes, and to great effect too. I have personally seen some rather fetching combinations going through, such as a fantastic yellow/orange stripe combination, and a green with red stripes. All carried out by a certain Mr John Schofield, who’s patience and attention to detail on the shoes makes them a highly sought after acquisition to any collector. They were only available from adidas themselves and a few chosen retailers, so I suggest you get two pairs, one to keep in its natural state, and one to be customised to really stand out from the crowd! If that’s your thing, of course, but it’s all about the shoes in the end, as we know.